Moonshine jugs are dishwasher, microwave, oven, and food safe. These old whisky jugs do not contain lead or harmful chemicals. 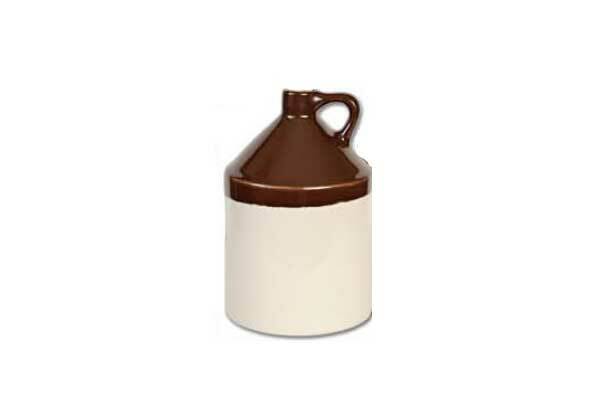 Ceramic jugs are easy to clean quality-made durable stoneware. You can safely store and drink liquor, fermented tea, fruit juice, soda, or water in these old whiskey jugs, or use them as a rustic decoration. Our moonshine jugs beg for leisurely reenactments of old time mountain music. Available in one gallon and half gallon sizes with optional corks for liquid storage. The corks are not recommended for long-term airtight storage. Stoneware whisky jugs are 100% American made. For a larger option, check out our 2 gallon insulated beverage dispenser. These stoneware growlers in two sizes are made for airtight liquid storage. These American-made, high-quality ceramic whisky jugs are a nod to the historical stoneware used to package moonshine and whiskey, America's homegrown spirit.With the arrival of steamboats in the early 1800s the beginning of moonshine distillery expansion was marked. By the 1820s commercial distilleries in the south were on the rise. So too was the stoneware industry, which produced the jugs used to package the country's precious whiskey. These add a nice rustic flair to a room. Very fun!